The resplendent château overlooks a populous city that got a derogatory nickname after some of its citizens heckled an elected official. Still, the house and grounds are so impressive they have served as the setting of several movies. The only people who died in the old mansion passed to the great beyond from natural causes, making it difficult to understand why the place seems to be a hotbed of supernatural activity. Each day, a new clue will be posted until someone names the location, providing the street address, city and state (or province/country if located outside the US) and an explanation as to how each clue applies to the location. If no one correctly names the location, the contest will end at midnight (Eastern time), Saturday, October 6, 2018. Please note, the contest ends at midnight in the Eastern Time Zone. If you live in a different time zone, please make adjustments so you will know what time it ends where you are. I may have a chance of naming this one since it's haunted. This is the Pittock Mansion at 3229 NW Pittock Dr., Portland, Oregon. The French Renaissance house was commissioned by Henry Pittock, a businessman and publisher of the newspaper, The Oregonian, and his wife Georgiana, both of whom were elderly, and finished in 1914. Georgina suffered a stroke shortly after they moved into their new home and died in 1918 at the age of 72. Henry died the following year at 84. Georgina’s favorite flowers were roses and she founded the Portland Rose Society, which laid the groundwork for Portland’s becoming The City of Roses. Portland is also known by the derogatory nickname “Little Beruit” after people heckled President George H.W. Bush in 1989 and vomited all over the hotel where he was staying. The protesters ate mashed potatoes, some of which were dyed red or blue with food coloring, then drank Ipecac syrup to induce vomiting. They intended to vomit red, white and blue chunks, but stomach acid changes food dyes and their regurgitations were green, proving once again that liberals aren’t the sharpest tools in the shed. 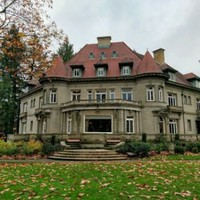 The Pittock Mansion was used as filming locations for the slasher film Unhinged (1982), The Haunting of Sarah Hardy (1989), and Madonna’s clunker, Body of Evidence, in 1993. It was also the final destination in the 2008 episode of The Amazing Race. Two of the ghosts haunting the house are believed to be Henry and Georgiana Pittock. People report the scent of roses, which has a connection to Mrs. Pittock. There are what sounds like someone walking in heavy boots in parts of the house and garden, which could be Henry Pittock, who was an avid mountaineer – he climbed Mount Hood. There are also reports of objects being moved and doors locking and unlocking.